'There is no positive side to credit card use.' Wrong! Ashford University professor Robert Lindquist recently urged consumers to "cut the [credit] card" and switch to debit cards. Last year, IndexCreditCards.com quoted Dave Ramsey, another personal-finance guru, who says on his website: "Responsible use of a credit card does not exist… There is no positive side to credit card use. 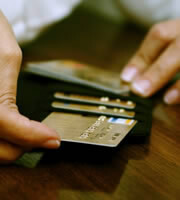 You will spend more if you use credit cards." Professor Lindquist's advice makes sense only if you assume he's addressing a minority audience: those who cannot control their spending when faced with the temptations of a credit line. In September, Chase Blueprint published research that showed that, among those whose financial situation had improved since the Great Recession, about 60 percent pay off their credit card balances in full every month or almost every month. It's likely that fewer than half of U.S. households have any credit card debt at all. Mr. Ramsey, meanwhile, appears to be relying on old research that suggested that many people spend more using a credit card than they do when paying with cash. There may be some truth in that, although a more recent study out of Carnegie Mellon University, "The Impact of Credit Cards on Spending: A Field Experiment," found, with some caveats, that the difference may be explained by the fact that cardholders tend to be more affluent than those who pay cash, and therefore make different choices about what to buy and how much to pay. Good luck to the social scientist who applies for a grant to prove that richer people spend more than poorer people, and make different price/value judgments. No doubt, Linquist and Ramsey were making good points of which those who are affected should be aware. But their comments feed into a wider narrative that wrongly paints credit cards as bad for everyone. In the wake of the credit crunch, it became a sign of financial responsibility to use a debit card rather than credit card, even among those who pay down their balances in full each month. First Data reckons that the use of debit and prepaid cards rose over the period from 1999-2010, while cash, checks and credit cards all declined. You get better protection from fraud. That's true from a statutory point of view, but also in a practical way: If someone drains your checking account, it's your money that's gone. If someone wrongfully charges purchases to your credit card, it's the issuer's money that's at stake. If you have rewards credit cards, you stand to earn valuable points, miles or cash back. Even for average-spending households, these can add up to hundreds of dollars each year. Chances are, your credit card's going to give you an interest-free grace period until the next statement's due. With debit cards, your money leaves your account as soon as the transaction's completed. Many, though not all, credit cards give you price protection (refunding the difference if you later find the same item cheaper), return protection (giving you the right to return eligible goods), and/or purchase protection (covering your losses if an item is stolen or accidentally damaged within, say, 90 days of your buying it). Similarly, many credit cards offer extended warranties. These typically extend a standard manufacturer's warranty by up to a year. A whole lot of credit cards offer perks. These range from privileged access to events to rental-car insurance cover. Some provide concierge services and allow you to cut lines and gain free access to lounges at airports, though these usually come with hefty annual fees. Check your credit card companies' websites to see which of these your plastic offers, and any accompanying terms and conditions. J.D. Roth, founder of GetRichSlowly.org, is another financial expert who's no fan of credit cards. But he takes a more considered line, acknowledging, "Many smart people ... use them wisely and never have problems." He personally didn’t use credit cards when he began GetRichSlowly.org because he had a bad experience soon after leaving college that saw him facing out-of-control debt that took him a long time to sort out. However, once he was out of debt and felt he could control his spending, he reconsidered and tiptoed back into credit cards. Some people (this writer included) struggle to master their plastic, and are better off avoiding it altogether. But for the responsible, self-disciplined majority, the opposite is the case. For them to prefer debit cards over credit cards is likely to cost them real money. You might even say they're cutting off their noses to spite their faces. 0 Responses to "'There is no positive side to credit card use.' Wrong!"